Interactive tech in the NY subway system. Last week I was having a conversation with a classmate about how it seems like New York City has failed to integrate technology into its transportation system compared to other cities. I spent a few weeks visiting my parents in Tokyo this past summer and became very well acquainted with Tokyo’s metro system and the ways in which technology aids travelers. For instance, all passengers use a universal “Passmo” card that scans instantly at kiosks and allows for instantaneous transactions. The Tokyo metro stations all have detailed instructions about how to navigate the city on the metro. There’s also free WiFi everywhere. 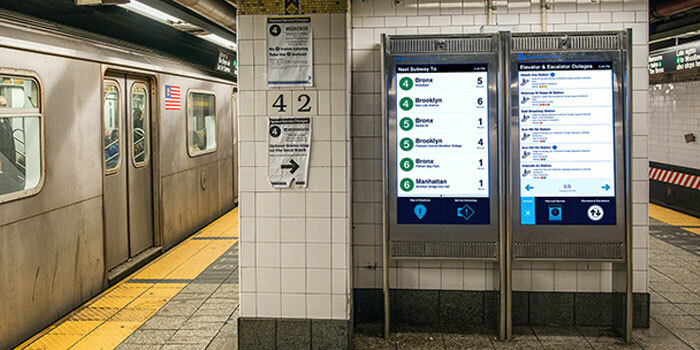 For this reason, I was thrilled to see the installation of new “on the go interactive wayfinding kiosks” in many of the New York subway platforms. The kiosks were designed by Control Group, which partnered with the MTA to improve the city’s transportation information. I decided to observe passengers interacting with the kiosks at the West 4th subway stop in the East Village. In terms of interface, the kiosks have a giant touch screen that displays neighborhood maps, visual directions based on real-time train information, and countdowns to train arrivals. Before observing the kiosks, I assumed that most passengers would use the kiosks to see when the next train would arrive. From my observations, however, I saw that most passengers didn’t typically use the screens. Those who did appeared to be tourists or visiting from other countries. I noticed that the kiosks were used most often when trains were running late or running on an alternate route and passengers were seeking additional information. The interface at the kiosks is extremely visual rather than text-heavy, which is conducive for people who might not be familiar with English. I didn’t notice people experience difficulties using the kiosks, although the information about train arrival times were not always accurate. People sometimes appeared frustrated by the lack of accurate information. Overall, I thought the kiosks were a brilliant move on the part of the MTA. It’s clear that the New York subway system needed more transparency in terms of information availability and ease of use. According to Chris Crawford, interaction is a cyclic process that requires two actors, human or otherwise, who alternately listen, think, and speak. In this way, physical interaction can be considered a kind of two-way conversation. In this regard, the kiosks are truly interactive.